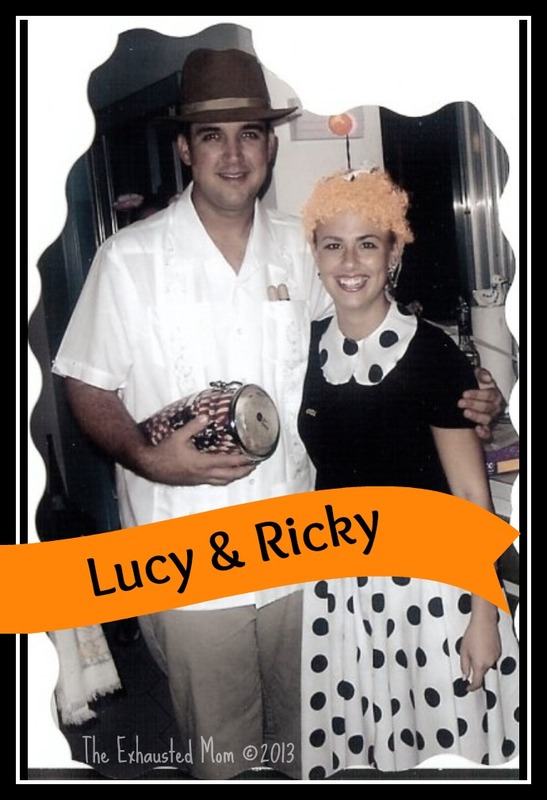 My husband and I really love Halloween. We have been dressing up since we started dating. 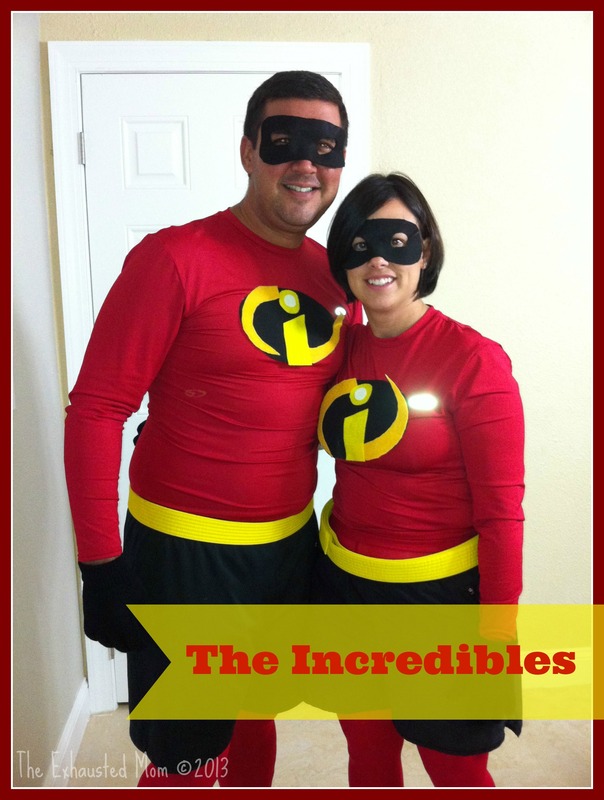 We are big fans of making our own costumes, we’ll buy pieces, but most of what we wear are homemade. Unfortunately, when deciding on which costume we will wear, we tend to wait until the last minute to put our creations together. Sometimes we don’t start until the day before and once we did it the day of Halloween. 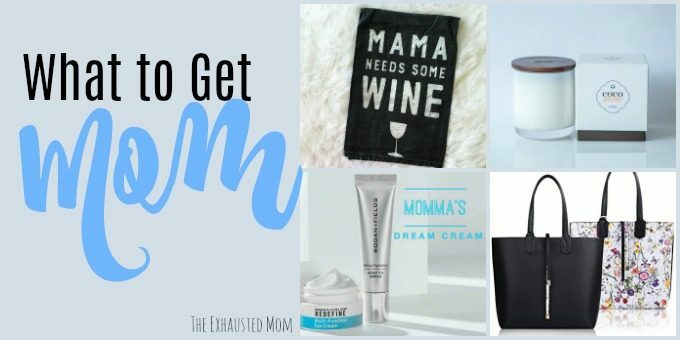 It’s a tad stressful, but SO much fun!! Since we have had kids, we have chosen characters that they recognize. You know, like the cartoon characters on their shows and movies. The kids even give us suggestions and are so into it that they will tell us as early as November 1st what they want us to be for the following year. 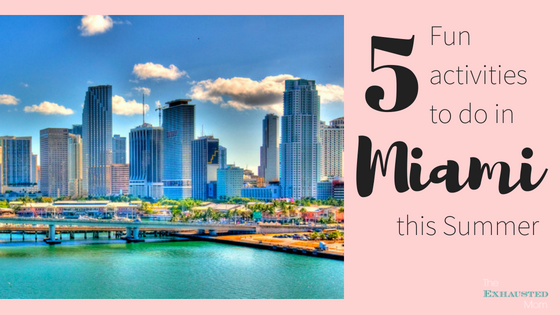 Take a walk down memory lane with me and check out some of our ideas. 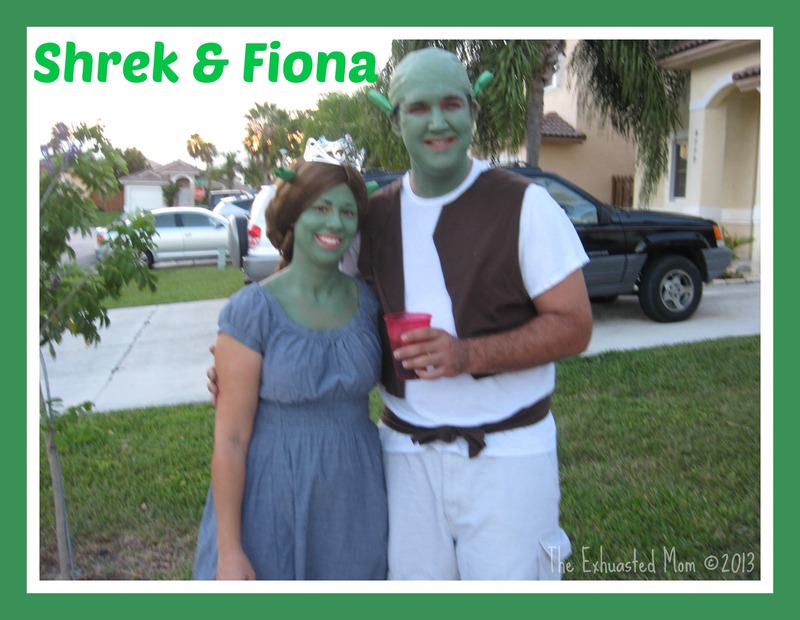 “Shrek & Fiona” was a last minute costume creation. We actually came up with it and put it all together on Halloween. I actually had this dress in my closet. I bought a crown , green face paint , & a skull cap. I made the ears by rolling up green construction paper. I cut up a brown t-shirt to make the vest and belt. The wig was actually a braided wig with pigtails that I tied together in the back. Ahhh….“The Incredibles”!! This was literally put together on Halloween day just hours before Trick or Treating. 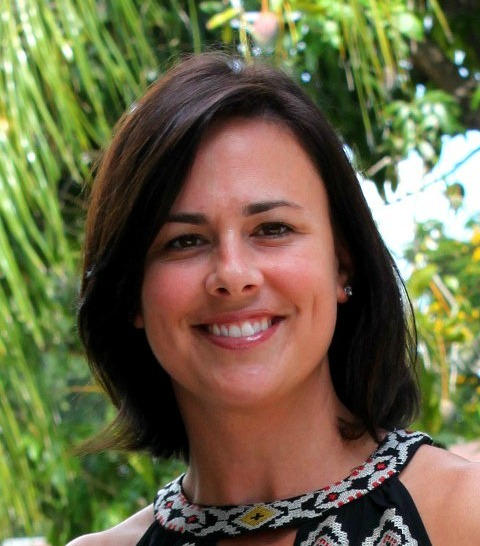 What a crazy day that was…. I found red dry fit shirts, black running shorts, black gloves & red tights at the store. (Yes, my husband the good sport wore tights!) I used my kids’ yellow karate belts as our belts. I got adhesive felt from the craft store and cut out the symbols for our shirts. Since all the felt was adhesive, it stuck on each other. You may want to hot glue the symbol together…the humid night made ours fall off. Also, the masks were made with adhesive felt so they stuck to our faces. 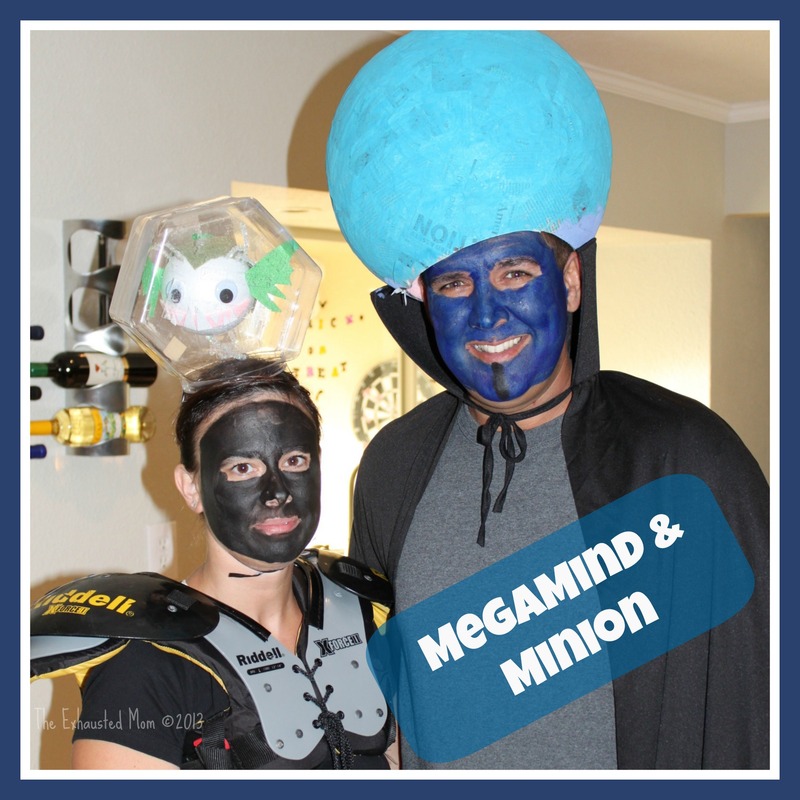 “MegaMind & Minion” was our first pre-planned couple’s costume. MegaMind’s head is made of paper mache. I used a punching balloon to make the shape and used watered down glue and newspaper to do the paper mache. I made Minion using a styrofoam ball , felt, pipe cleaners & googly eyes. I put the “fish” in a plastic container that I mounted on a headband. I got the face paint & cape from the Halloween store. I borrowed the football pads from a local kid to simulate the robot body of Minion. I was nervous that no one would get it…but surprisingly, people stopped us and knew exactly who we were. I really think it was Megamind who pulled it off for us. 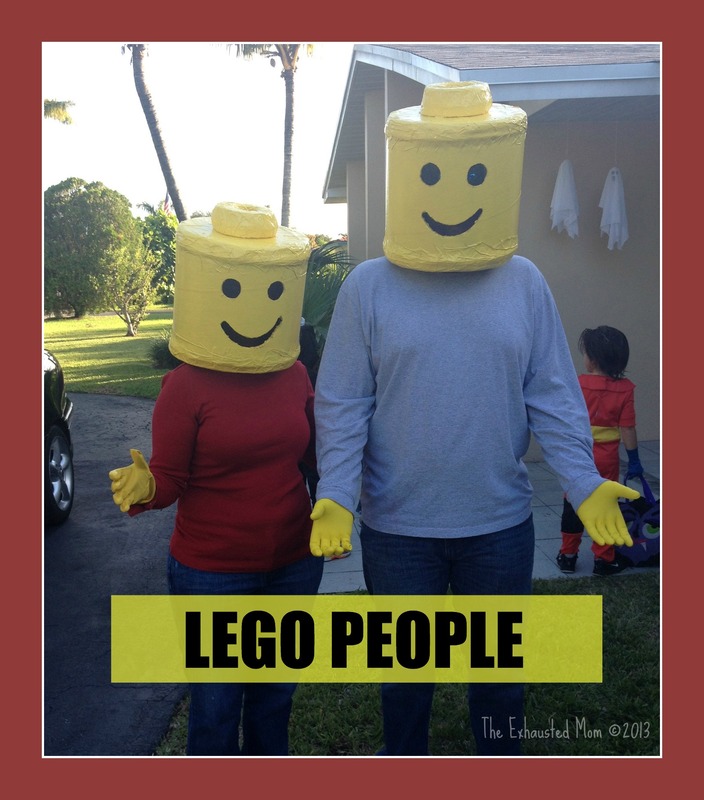 And then we were the “Lego People.” Another majorly planned costume. This one took research, directions, a visit to Home Depot, and MANY hours. After making the heads completely from scratch, I was too exhausted to make the bodies, so we just wore jeans, long sleeved shirts and rubber kitchen gloves. 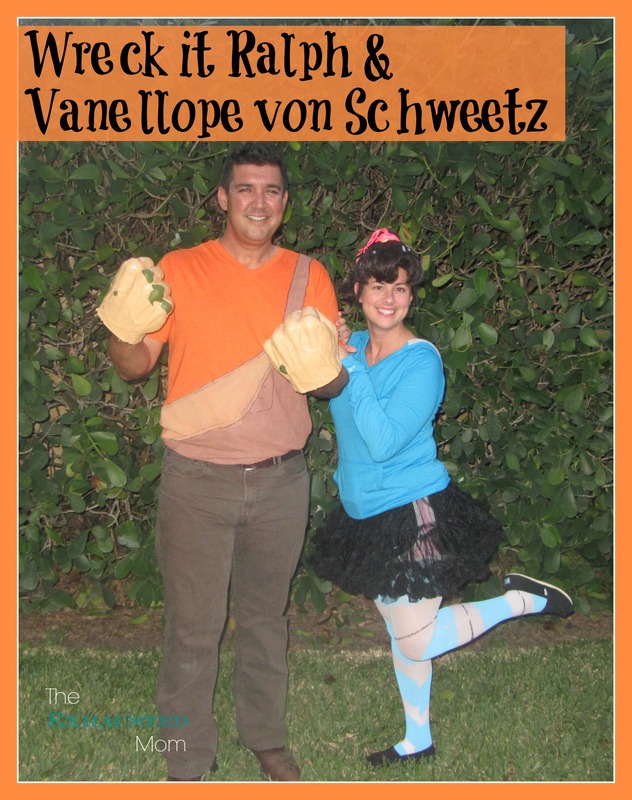 Fabric paint and Sharpies were my friend when making Wreck It Ralph & Vanellope von Schweetz! For Ralph, my husband already had brown jeans…it was easier than buying overalls that he would never wear again. I found a cheap orange v-neck and painted the illusion of a flopping overall bib on the shirt. Then I used my kids’ Hulk Hands and spray painted them flesh color. (Only problem was every time he smashed them together, the paint would peel away!) For Vanellope, I found a black tutu & ponytail wig (my hair is too short) at the costume store. I got a turquoise hoodie and white tights. I painted the stripes on the tights with fabric paint and a Sharpie. I bought jeweled stickers and plastic candy and glued them to bobby pins for my hair and used florescent pink shoe laces for a bow. 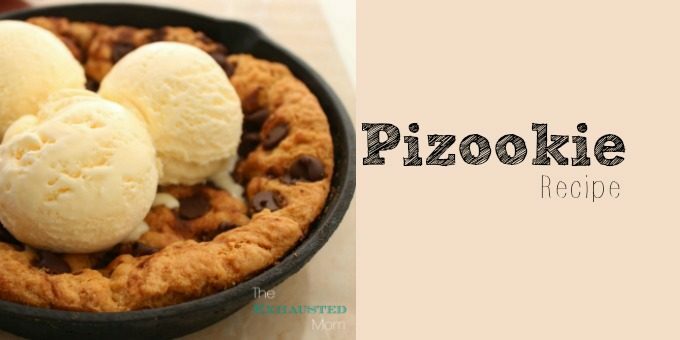 This last minute costume idea was so easy to put together. I had the clothing items for Sam Sparks in my own closet (shorts, pink tank top, pink button down, belt) and most of Flint Lockwoods too (jeans & a t-shirt). 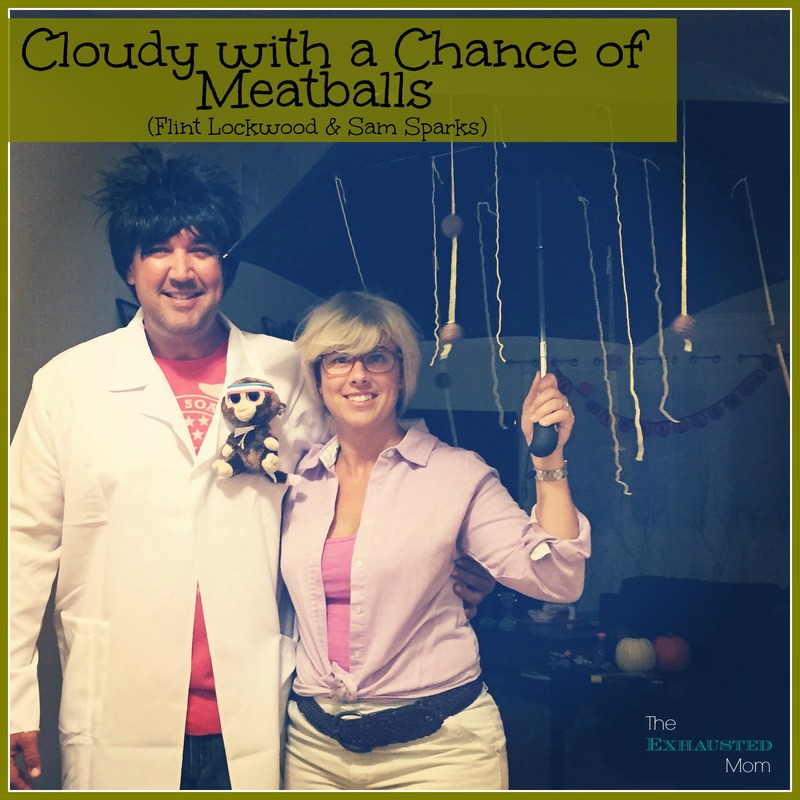 I headed to the Halloween store for the blonde wig, crazy hair wig and the lab coat. Found “Steve” the monkey at Hallmark and my kids made his headband and speaker (which you can’t really see) with paper and markers. For the spaghetti and meatballs umbrella, I used yellow yarn and these decorative foam balls that were covered in brown yarn that I found at the craft store. I strung the yarn through the middle of the ball and tied them to the inside of the umbrella. It was really easy! Do you like dressing up? 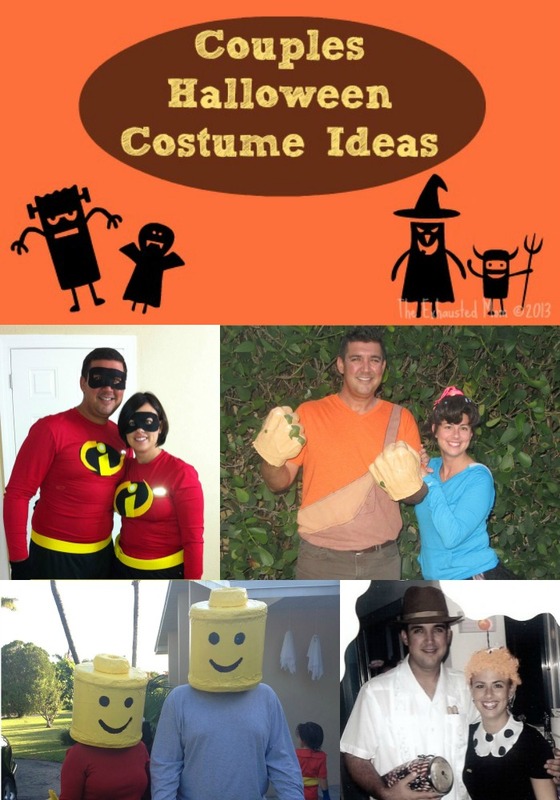 I hope some of these costume ideas were inspirational for your next couple’s Halloween costume! You guys are so cute! Thanks Terry! We LOVE dressing up!